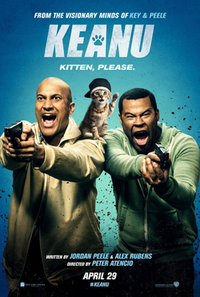 Keanu is a 2016 American action comedy film directed by Peter Atencio and written by Jordan Peele and Alex Rubens. The film stars Peele, Keegan-Michael Key, Method Man, Nia Long and Will Forte. Filming began in New Orleans, Louisiana in June 2015. The film premiered at the South by Southwest Festival on March 13, 2016, and was released theatrically in North America on April 29, 2016, receiving generally positive reviews from critics but was a box office disappointment, grossing $20 million against its $15 million budget. This webpage uses material from the Wikipedia article "Keanu_%28film%29" and is licensed under the GNU Free Documentation License. Reality TV World is not responsible for any errors or omissions the Wikipedia article may contain.